…Cheers! Once again, I was working on this post when a different idea poked me in the ribs. You probably don’t know this, but our Honore is an I-Love-You-Present Fairy. Dear reminders of her friendship randomly appear in my mailbox and make my day! [Thanks so much for the GIANT tags last week. I’m using one on the new album cover…but, I digress.] 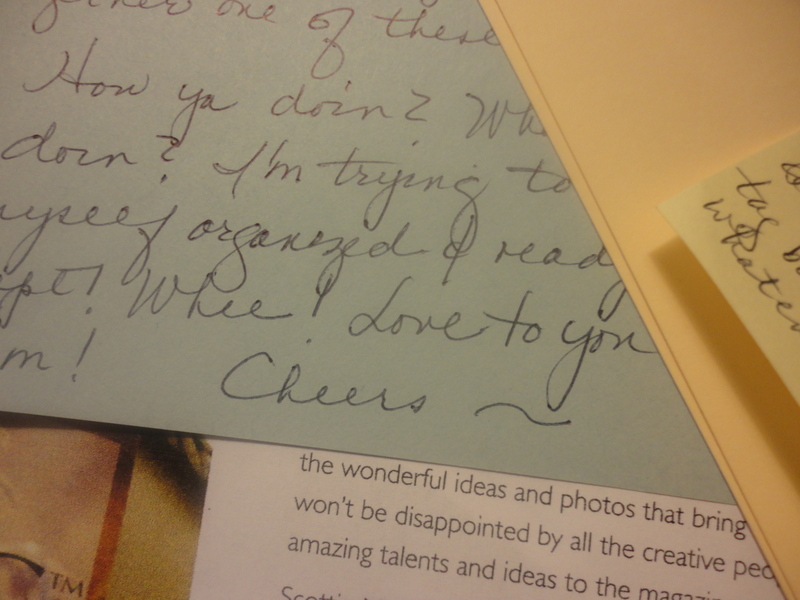 Honore always signs off a letter or note with Cheers! Fits, doesn’t it? 03 Sep	This entry was written by kmgraybeal and published on September 3, 2012 at 7:43 am. It’s filed under Celebration, Connections, Friendship, Gratitude, Kathy, Lifeology. Bookmark the permalink. Follow any comments here with the RSS feed for this post. And just like that, the circle is closed. Serendipity rocks. I never ever looked up the phrase but I’m like you – I go for the “here’s to your and my health and welfare.” Thanks. This post brings a huge smile to my face. Looking fwd to seeing the tag in use.